Our science editor, Krissy Kendall, PhD, CISSN, answers your questions relating to nutrition and supplementation to optimize your physique, health, and performance! Q. I drink a lot of coffee, but I've been told it's a diuretic and I shouldn't count it toward my daily fluid requirements. Is this true? We've all heard the warning before: Coffee has a diuretic effect, it's dehydrating, and it shouldn't count toward your daily fluid intake. Given that most of us who pursue fitness rely on coffee for its pick-me-up effects, are many of us unwittingly contributing to poor athletic performance because we're in a state of chronic dehydration, or can it contribute to our daily fluid requirements? Before we get into the research looking at the effects of coffee on hydration levels, let's first identify how much fluid we should be taking in every day. Individual requirements can vary extensively across populations, and can differ based on gender, activity level, rate of sweat, altitude, and climate. Generally speaking, women require about 90 ounces (11 cups) of fluids per day, while men should aim to get around 125 ounces (16 cups) per day. And if you're a coffee drinker like myself, it's recommended you drink an extra glass of water for every cup of joe. Given those guidelines and the amount of coffee I drink regularly, I might as well set up my office in the bathroom! But seriously, is all that extra fluid consumption really necessary? If you're a coffee drinker like myself, it's recommended you drink an extra glass of water for every cup of joe. So where exactly did this "coffee dehydrates you" myth come from? My guess is that it all started with earlier studies that found coffee increased urine output. 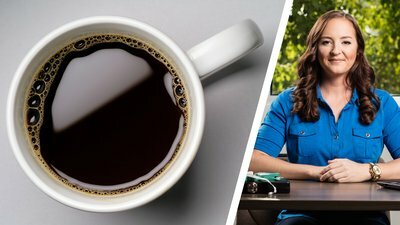 The problem with these studies is that they only measured urine production 2-4 hours after consumption (failing to look at the 24-hour picture), they didn't compare the effects of drinking coffee to drinking water or other noncaffeinated beverages, or they used ridiculously high doses of caffeine in one sitting. Caffeine consumed in large doses (more than 500 milligrams, which may be as many as 5 cups of coffee) can elicit a diuretic effect. However, regular consumption can build up your tolerance so that you don't experience those initials effects, meaning you might soon require more. Don't get me wrong, I still think drinking adequate amounts of water and staying hydrated are important, especially for those who are physically active. Chronic dehydration can have a significant impact on performance and lead to headaches, fatigue, and muscle cramps. But do we need to eliminate coffee altogether? Absolutely not! If you notice you're not performing as well in the gym, experiencing muscle cramps, or lacking overall energy during your workouts, you may want to cut back a little on the bean juice, or drink 2-3 more cups of water or low-calorie beverages throughout the day. Silva, A. M., Júdice, P. B., Matias, C. N., Santos, D. A., Magalhães, J. P., St-Onge, M. P., ... & Sardinha, L. B. (2013). Total body water and its compartments are not affected by ingesting a moderate dose of caffeine in healthy young adult males. Applied Physiology, Nutrition, and Metabolism, 38(6), 626-632.